But yesterday, my daughter pulled out the watercolors and completed a drawing… and I guess seeing them sitting on the table stirred up some creative juices. I haven’t painted in watercolors for many, many years. Today I completed my first watercolor painting in many years… and I enjoyed it! Working in watercolors, for me, allows me to be more free with my brush. I’ve become more of a realist over the years, and watercolors, being so fluid, forces me to paint more loosely. My experience with this painting, is that it taught me to not be so concerned with every single stroke of the brush — that it’s OK to have paint bleed into another area… to not have a line so straight. I think it still holds a bit of realism, but there are some parts that make me think that by using watercolors more often, I just might teach myself to be more impressionistic with future works. This is a painting of my daughter. The reference photo is a self-portrait that she took of herself. I’ve added it to the gallery here, and to other social media. Visit my Facebook and DeviantArt for larger images. 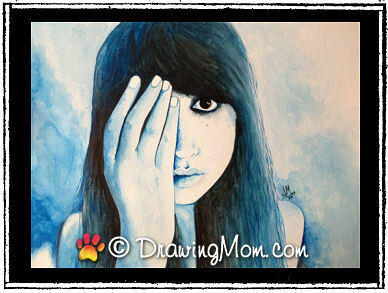 This entry was posted in Art and tagged Blue Girl, daughter, paint, watercolors. Bookmark the permalink.